What a fun weekend, there were bake sale’s going on all over the states to raise money for Share Our Strength. 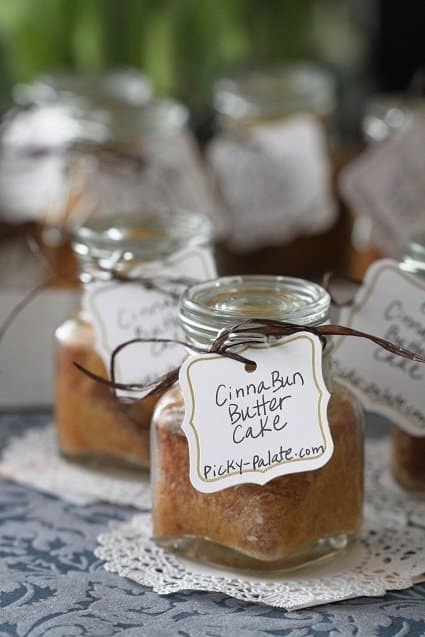 I had the privilege of baking for the LA Bake Sale Saturday and prepared my simple Cinna-Bun Butter Cakes in a Jar as you see here. Huge thanks to Gaby Dalkin of What’s Gaby Cooking for heading up the event. She is the hostess with the mostess! I heard LA produced over $2300 for charity. So great! I found those adorable jars at Michaels for a buck a piece along with the fun little tags. I love them. I also found them on Amazon that you can order online! Kinda funny, I couldn’t be at the LA Bake Sale because we were in San Diego, so I went to the San Diego Bake Sale to visit my friends and buy some goodies. Those ladies had a packed house. It was so much fun seeing them. I thought I’d share my little Bake Sale goodies with you, they’ll work in any size jar. My cinnamon filling makes for a buttery cinnamon-y jazzed up cake mix cake you will not forget 🙂 Enjoy! 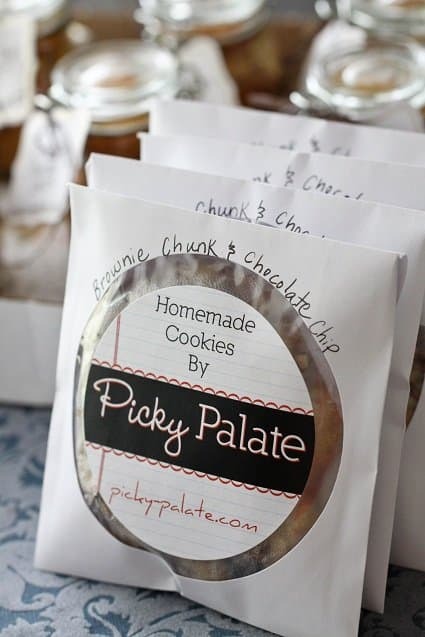 Love these labels that Party Ink custom made me for my baked goods! Perfect for bake sales, and gifts for friends. The cookies are placed in CD white paper liners. Such a fun way to wrap up cookies! 1. Preheat oven to 350 degrees F. and spray baking jars of choice with non-stick cooking spray. 2. Place cake mix, oil, sour cream, eggs, and pudding mix into the bowl of a stand or electric mixer, beating until well combined, about 1 minute. 3. Place flour, brown sugar, cinnamon, and salt into a medium bowl, mixing to combine. Cut cold butter into small cubes, add to flour mixture and use a pastry cutter or a fork and cut butter into mixture until well combined and crumbly. Takes a good 5 minutes. 4. Depending on the size of jar you use, this step will be different for every size. For the tiny jars I used, I placed about 2 tablespoons cake mix into the bottom, topped with 2 tablespoons cinnamon mix and topped with another 1 tablespoon of cake mix. No matter what size of jar you use, only fill it 1/2 full or you’ll end up slicing off the top that bakes over the top. Use your best judgement according to the size jar you are using. Layer cake mix and cinnamon topping until you reach 1/2 full of your jar. 5. For my tiny jars, I baked them for 19 minutes and they were perfect. If using larger jars just keep a close eye on them after 20 minutes of baking. Carefully remove hot jars from oven, let cool then close with lids. Find some cute tags and wrap around top with a ribbon. 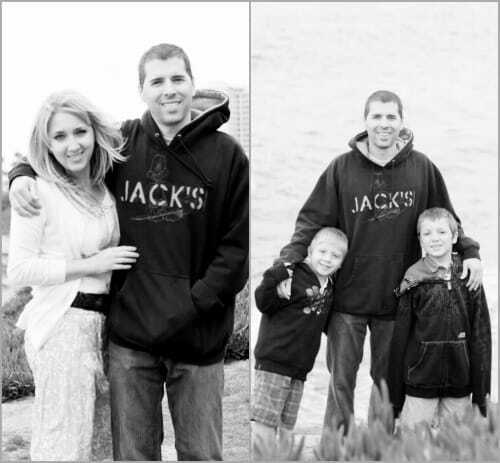 Snapshots at La Jolla Beach with my stinkers over the weekend, have a great new week!! 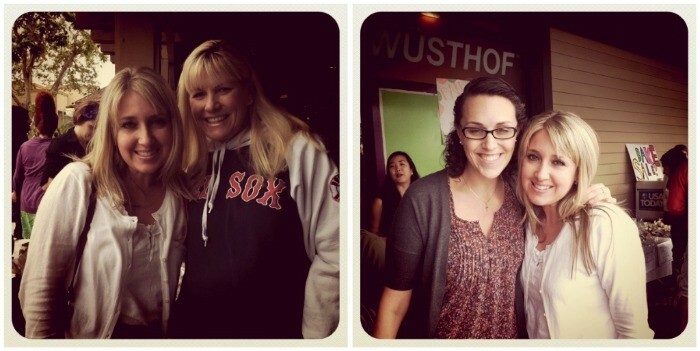 SO nice seeing you again, Jenny! Hope you had a wonderful day with the family. What a neat idea! I might have the kids in my class make these for their dads for Father’s Day! Thanks for sharing! These look amazing! I bet they were a huge hit at the bake sale!! I would have gobbled those up at the bake sale. Great idea! Ok so I didn’t finish reading the post but I was so excited when I saw your idea for cookies in a CD cover that I just had to comment right away while my excitement was fresh! perhaps that Idea has been around for a while but since me food blogging hasn’t been it’s new to me and I think IT’S TOTALLY AWESOM!!! Such a great idea. We are having a garage sale on saturday and my son wants to sell cookies and lemonade, this is the prefect way to package them. I’m ordering CD covers as soon as I finish this comment. Hope the garage sale went well!! Loving my CD covers for cookies! Oh that all looks so yummy! And that is an ingenious way to wrap a cookie! Love it! These look fabulous. Thank you so much for the ideas and the recipe. I love the CD holders for the cookies. I’d love to know where you got your jars for the cakes. They’re fabulous. I found those little jars at Michaels! Only $1 per jar. I was so hoping you were giving us a template to make the cookie labels ourself. 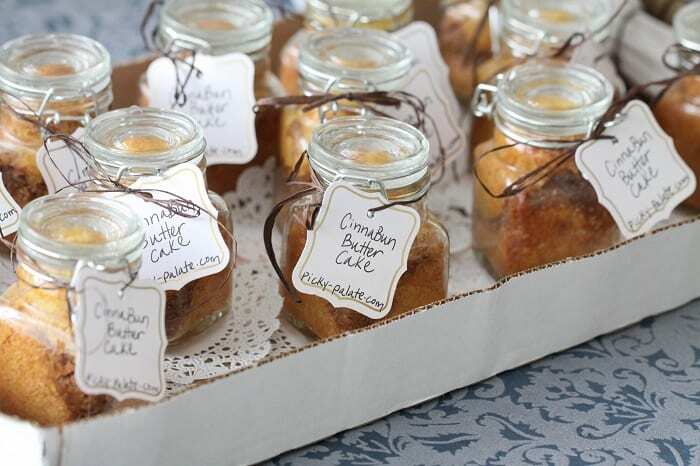 Love the ideas, have done cakes in a jar before, they are really neat. I would have loved bumping into you! Or would have I think driven to LA just to have one of your cinny cakes in a jar. holy fabulous idea!! SO fun to see you at our bake sale!! Thanks for spending some money 🙂 What a cute idea your jars are. And I absolutely LOVE the cookies slipped into CD wrappers w/ those darling stickers. Saving that idea for next year!! Love ya, Girl… see you in a few days! Looks like you had a great time! Love the cakes in the little jars! And the tags are super cute! These are too cute. I love the way you packaged your baked goods. What a fun day and your treats look amazing! Your packaging is adorable. Some really great ideas. I’m so glad the Bake Sale was such a great success. I adore your packaging!! so beautiful!! I’m sure who ever went home with this cinna-bun butter cake was in heaven! Always great to catch up, Jenny! And it was lovely to finally meet all your gentlemen. 🙂 We’ll be sure to snap plenty of pics in ATL – see you soon! Can’t wait for this weekend Kathy!! So cute! And sound yummy! These are amazing and if you don’t have a little shop you should open one! I love cakes/cupcakes/muffins baked in jars. Best way to ship goodies to friends in far away places. Congrats on raising so much for a great cause! 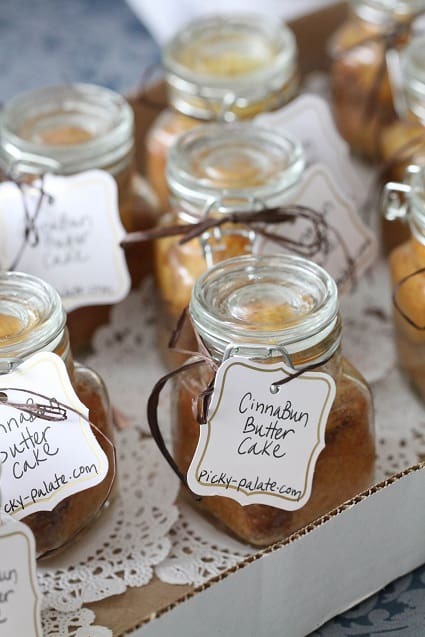 Love your little cakes in jars! What a cute, fun idea! Jenny these are adorable, not to mention sound delicious!! I love the “in a jar” movement going on right now! Looks delish! Mmmm these look so lovely! can i ask how much you charge for the beautiful cake in a jar – and yours are truly beautiful. I did not price my cakes at the bake sale, so I am not sure what they went for 🙂 Thanks for your compliment! ADORABLE and perfect size for a Fundraiser/Bake Sale! Did you bake these jars in a Bain Marie or how did they go into the oven? Thanks! I would like to bake these in muffin pans. Have you tested doing that? Just wondered if you had the timing, if so. If not I will test myself. I make the same cake and bake it without a cinnamon topping and when done remove the plain cake from the pan and let cool. I then melt 2 sticks of butter and mix two cups of sugar with 2 tablesppons of cinnamon. I dip the cakes in the butter, making sure to cover the entire cake and then roll in the cinnamon sugar. Wonderful. A taste of heaven. Also, Have you ever tried Penzy’s cinnamon? It is outstanding!!!! Especially the Vietnamese Fancy cinnamon. Their vanilla can’t be beat either. I haven’t tried that yet Marianne, but I think it would work just fine 🙂 I’d start the baking for 17 to 18 minutes and check often from there. So so cute and clever. Hi! Another great recipe… looks beautiful and delicious,… as usual! I wondered if you could help me out. 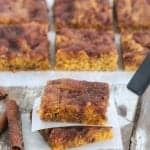 How do you store all of your recipes? I was wondering if you had them on computer or in a binder? How do you organize all of them?! I would love to start a good system and thought you may have a good idea, or can refer me somewhere else. Thank you!! I just store them on my blog 🙂 If I didn’t have them all accessible through my blog I would probably store my favorites on my computer in categories. Easier than bulky binders. Good luck! 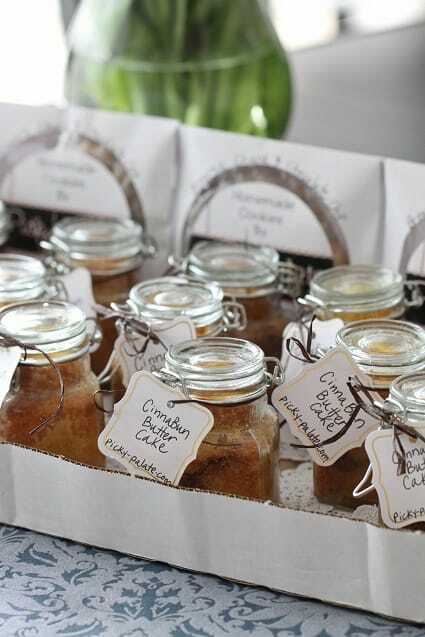 Those cakes in a jar are the cutest! Love them!! You just never cease to amaze me with your kitchen creativeness. These cinnabuns in a jar are the cutest things I’ve ever seen! Thank you for so generously sharing all your wonderful knowledge, cleverness & recipes. What a cute idea! The jars are adorable and the cake sounds delish! Thanks Heather, it really was so much fun. Marla, thank you so much for transporting my treats to LA! Wish I could have been there, looking forward to our weekend in Atlanta!! The presentation and packaging of your treats is fantastic! Lovely shots of you and your boys. Especially the butter cake. I wish that I could have been there to buy two or ten. Thanks so much for the recipe and packaging ideas!! I LOVE the wrapping a cookie in a CD cover idea! GENIUS! Now, if only my cookies were BIG enough to look good in a CD cover 🙂 LOVE your site! What a lovely, useful ideas with packaging! First time on your blog and I am glad my sister-in-law forwarded your blog to me! Will be back to check all your previous recipes! These are adorable!!! What a fun idea! And thanks for sharing this delicious recipe. Yum!!! These are such a cute idea! I’m thinking of using these for end-of-the-year teacher treats. How many small jars were you able to make with one batch? Thanks! I love those cute little jars! Such a fun idea! Love this idea! I wonder how easy they are to eat from the jar? Small spoons?